There are few things in life as exhilarating as a ride in a Ford Mustang. This popular performance car is equipped with the latest audio technology designed to deliver a thrilling driving experience that will connect you to the road. The Mustang enthusiasts at Palm Springs Ford are excited to demonstrate to you these innovative audio features so that you can feel the power. The audio engineers at Ford have designed a signature sound that connects drivers with the internal DNA of the Mustang. The patented throaty sound of the Mustang activates when you step on the gas, immediately connecting drivers to their venerable performance vehicle. A switch on the center console allows drivers to customize the sound to match their mood. Choose normal, loud, aggressive or peaceful settings to meet your preference. 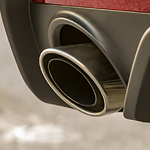 The new active performance exhaust will be available with the 2.3-liter EcoBoost-powered pony car during the summer of 2019.